I'd been a good boy all week in terms of nutrition and exercise, and so had Happy Meal. We decided to treat ourselves to a cheeseburger. Destination: Jake's of Pasadena. Why: We had a Groupon. Parking in Old Town Pasadena on a Sunday afternoon was a nightmare, but we found metered parking a few blocks away. 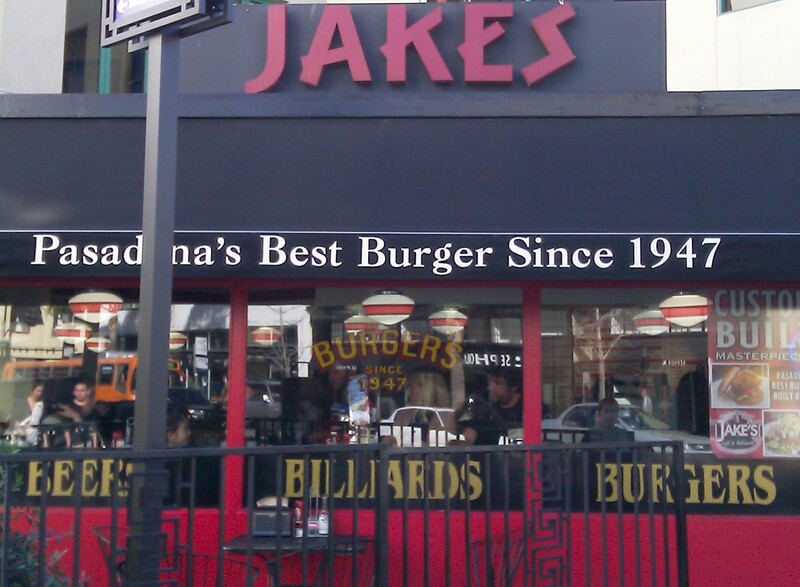 The signage proclaimed that Jake's of Pasadena served the best burger in Pasadena. I had to wonder if they could top Plate 38, which was really darned good. The seating was nearly all counter--several counters, and there were three small tables tucked away in a corner. Happy Meal loves counter seating, and I obliged. We opted for the Build Your Own Burger route. Ordering at Jake's of Pasadena was a matter of checking boxes on a form and handing it to a server. Our cheeseburgers arrived in about 5 minutes. The Beef: The burger meat at Jake's of Pasadena was about 1/3 of a pound of Chuck. The patty was strongly beefy with a firm note of funk and a bit of iron at the end. I assumed that the beef was sourced from Sysco Foods, since most everything else there was. The Chuck had a fat content of about 20% fat. The grind was coarse, and the beef lingered after the cheese and bun had departed the palate. The firmness and grind of the beef was satisfying in terms of mouth feel. The kitchen did employ griddle weights while cooking the burgers, but this did not dry out the irregular, hand-formed patties. The Seasoning: I noted that the burgers were not being seasoned as they cooked, so I interceded. I wanted a good burger. I asked the kitchen to apply a little salt and pepper to my burger as it cooked. If you go to Jake's of Pasadena, I strongly encourage you to mirror my request. The Sear: Hell yea! The griddle at the busy establishment maintained its heat, and the burgers were delivered with a deep, dark, crisp sear. The sear on my burger was most satisfying when coupled with the requested salt and pepper. The Preparation: The cheeseburgers at Jake's of Pasadena were cooked to Well-Done but not an aggressive, dry Well-Done. The 1/3 pound burger patties were hand-formed during the morning prep shift. 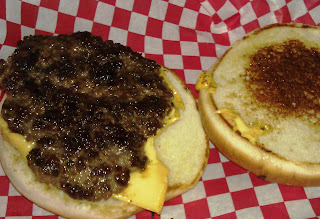 The patties were formed gently, and this resulted in a bite that was firm but not chewy. 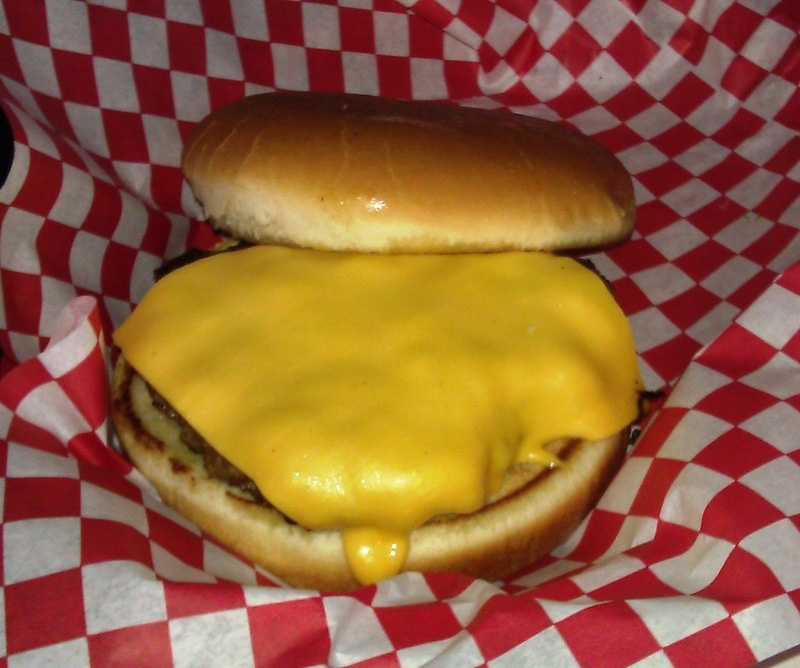 The Cheese: There were a variety of cheese options, but I chose American cheese to top my burger for the usual reasons: creaminess, savoriness, umami, and iron. The perfectly melted cheese delivered on all of those points. Furthermore, the cheese served to wed the bun to the beef. Keep in mind that they charged $1.29 for a slice of American cheese. The pricing was aggressive...leaning towards offensive. I can buy 32 slices for $5 down the street, so I found a 800% markup over retail just plain outrageous. The Bun: Jake's of Pasadena also offered numerous bun options. I went with the standard burger bun. The bun did not disappoint. It was fresh, moist, a little sweet, and perfectly toasted. The kitchen buttered the buns and toasted them on the flat top alongside the burger patties. The Meat To Bun Ratio: The large bun was a little too large for the single burger patty. The bun would have been more appropriate to a double burger, but a double burger would not have been appropriate to my long-term survival odds. 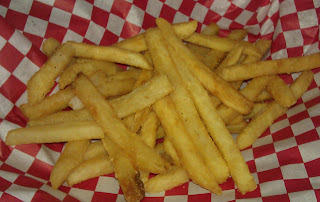 The Fries: The fries were the standard, food service, frozen, peel-off, par-cooked, peel-off fries that show up in a bag. The fries were perfectly crisped and nicely seasoned. The fries were about $2, and the portion was not impressive. The Toppings: I passed on the shredded Iceberg lettuce, because it was shredded Iceberg lettuce. The tomato slice was red, ripe, juicy, and flavorful. I splurged and got some avocado. The avocado was just fine. The Value: Meh. I dropped 10 bucks on a 20 Groupon, and I still paid an additional 9 bucks (incuding tip) to cover the bill. It was about $25 for two cheeseburgers, one order of fries, and two sodas. This was a little more than the quality of the food warranted. The value was a little below average. Jake's of Pasadena was not the best burger in Pasadena. Plate 38 was better by far. However, the burger at Jake's was flavorful and properly prepared. It may have been the best burger in the neighborhood....it was the only burger that I had sample in that part of Pasadena. Burger Review : A competent, flavorful, but slightly over-priced burger at Jake's of Pasadena.